Shetland pony found at Wyboston. There was a traffic obstruction of the equine kind yesterday morning, Tuesday, April 14, near the A1 at Wyboston. Bedfordshire Police were called to reports of a small brown pony loose on The Lane at around 7.30am. 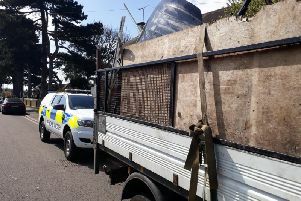 A further call to police revealed the runaway Shetland had been kept in the garden of a concerned resident of the same road overnight, but it had since escaped and was heading towards the dual carriageway. PCSO James Loi said: “This is a very friendly pony which took a special liking to my colleague, who supplied it with fresh water and grass. We would like to thank the nearby resident who has kindly offered to home the pony until its owner is found. The animal is now back at its temporary home but anyone with information on who it belongs to is asked to call the non-emergency number 101.